Syria: "Fighting a new kind of war"
I arrived in Raqqa in the second week of November, just three weeks after the fighting subsided. Seeing the city for the first time was shocking. The total destruction, the fact that no building is left untouched is something that your brain can’t quite compute. It's eerie. It really brings home to you what the population have lived through, and just how extreme life must be during the conflict, as well as living with the consequences. I was nervous about working in Syria, but my experience so far has been extremely positive; a lot of the things I was worried about have not been problematic, and I have fallen in love with our staff. They are amazing, hardworking, committed and keen to be there to drive the project. They have been through something incredibly traumatic and are now having to deal with, as they put it, ‘a new kind of war’. Although the heavy fighting is over for now in Raqqa, they’re fighting a new war with all the blast injuries. 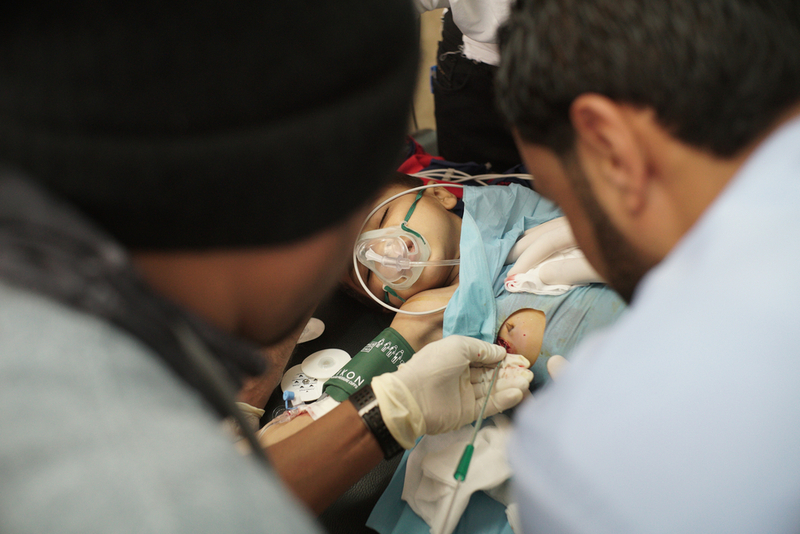 The nature of our work in Raqqa is relatively new to MSF. Treating mine-blast victims on such a large scale it is not what we see in other conflict zones and extremely difficult. In my first hour in the emergency room (ER) we received the first blast victims. It was a chaotic atmosphere as we had not really had a chance to get into a good flow - with basic resuscitation and everyone working as a team and knowing their role. However, after a couple of weeks, it felt like we were making great progress managing the patients. It is a sensory experience in the ER. There is always a strong smell because of the burns, it’s chaotic – patients from the blasts usually come in threes or fours, but sometimes as many as 11 arrive all at once. It is different to anything I have ever done before in my career. The nature of the injuries – much like the destruction in the cities – is hard for your brain to comprehend. It is very unnatural and some of the injuries are so severe it’s very sad to see. All we do is stabilise the patients, as well as we can, with the equipment we have, and send them to the MSF-supported Tal Abyad hospital (two-hours' drive north) for surgery. It is very difficult without blood products and immediate surgical care but we are doing everything we can. We have had a number of paediatric mass casualties in the ER. Because of the nature of the land mines, often it is the children who are playing around in the rubble that get hurt. One day a three-year-old girl arrived with not much left of her left limb. She was barely conscious. Everyone in the ER froze a little because the injuries were so horrific. Her father was there and was very calm and reasonable, but he was obviously very, very distressed. We got someone to look after him and got to work. We all snapped into action, we all took up our places and, somehow, managed to stabilise her and send her for surgery. We found out the next day, from the MSF surgeon in Tal Abyad, that they had managed to save a lot of her right leg and some of her left leg. This little girl had survived! It is always a bit of a double-edged sword when a patient is in such a critical condition. They survive, and that is all you want. As a doctor, that is what you are there working for. But, at the same time, part of you knows it will be such a hard road ahead; they have lost one or more limbs, they have to recover in a place with limited aftercare and where there is little or no prosthetic limb provisions. At times like this it is very emotional for everyone involved. There are a lot of positive stories. We soon became very well-rehearsed with a strong team and got into a flow of receiving multiple trauma patients, of which the outcomes were mostly good. To see the team rallying together – coming from very different nursing and doctor backgrounds was great to see. The Syrian staff told me that working for MSF is a lifeline for them. Many have been unable to work for some time due to security issues or health facilities being closed and, although they are seeing trauma every day, they are now able to help in some way. It is empowering for them. They are medical people and this is their vocation – they feel like they have a purpose again. "We are giving people some hope, and that is the important thing to understand. Although some of the threat has been removed it is not over." Things have calmed down a bit now. The first few weeks were extremely hard when setting up the project. At that time we were a very small medical team its was only myself and another doctor, medically speaking. We had one house: the ER was in the front room; the office in the middle room; and the two bedrooms were at the back. It was very intense. Now we have grown a little so life is easier. We have moved into a new building and we have more space. Setting up the women’s health programme has been extremely rewarding too and is something the community really values. I do miss home. You forget how worrying it is for the people you leave behind because, for you, it becomes normal life. At home your family just see the news and Syria headlines – you forget about the impact it has on them. Whenever I have a bad day, and think too much about the limit on my freedom being in Raqqa and how much you miss people back home, I think about the staff and the patients and what they have gone through. I think about what they will all continue to go through and it puts everything into perspective. To MSF supporters back home, please know that our work here in Raqqa city is significant. We are the one of the very few healthcare providers, and with a large number of people returning home, the needs are great. We are giving people some hope, and that is the important thing to understand. Although some of the threat has been removed it is not over. They have lost their homes, their jobs, family and friends. Everything. It is so important to be here supporting them at such a difficult time.